Our Lady of Light church seemed to have trouble since the very beginning. The first strange occurrence happened right after the Easter Vigil in the very early morning hours. All the leftover Eucharist was found strewn in a circle with a bottle of pre-blessed wine like someone had been having an after-mass hangout session. The volunteers that found it while setting up the flowers the next morning naturally blamed Father Jo. Until that is, strange symbols were found carved into the melted wax of the sacristy. The fear didn't end there. Mysterious sightings of an angry woman in black paired with the haunted happenings and had everyone in whispers for decades. Until someone discovered an old newspaper clipping about a nun that went off the rails when Our Lady of Light was consecrated. She met a weird end that was whisked under the proverbial carpet. This Halloween, bring a little bit of holy haunting to your front door when you add this holy terror to your decor. 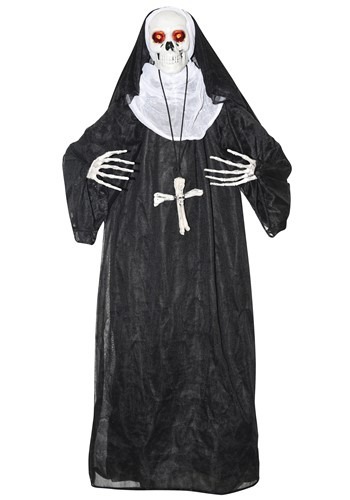 This hanging nun prop has a molded grinning skull with glowing red eyes. 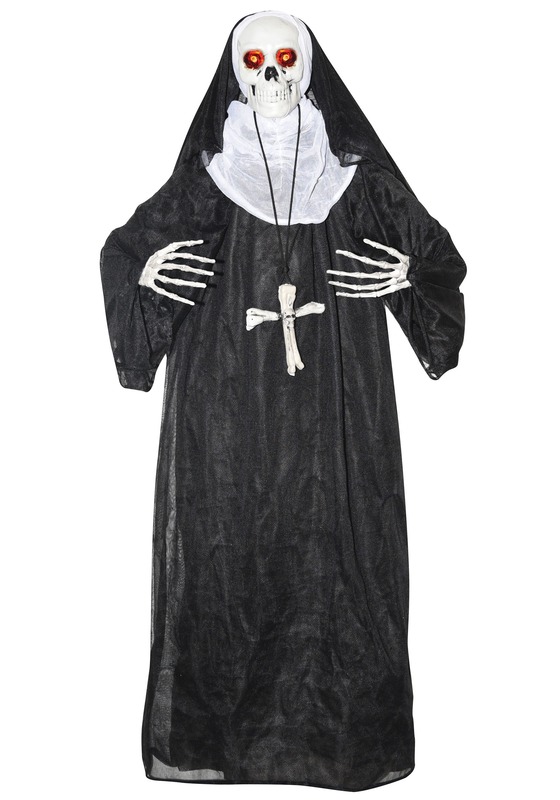 The skeleton is dressed in an instantly recognizable nun habit and has an eerie cross necklace that fits her style just right. It comes with demo batteries for an instant terror fix but can continue to fright with three AA batteries that let her continue to swing back and forth and repeat a variety of spooky phrases.